A bonus mesh pocket and zippered pocket are the perfect spot for managers to put the included dry erase markers, storage bag, and any other extra items. BUILT-IN DRY ERASE LINEUP CARD - Lineup card with 2 dry erase markers included. Post your lineup card for the whole team to see. Separate name tags over each slot allow for easy organization of game day gear. EASILY HANGS ON MOST DUGOUT FENCES - Features 7 metal fence hooks (5 upper & 2 lower) to easily hang from most chain link fences, keeping the organizer stable without sagging or tearing. 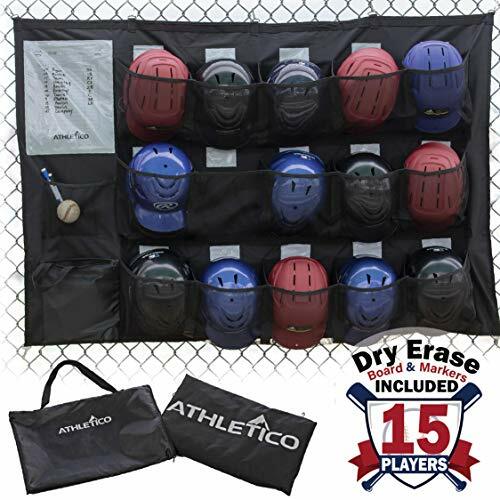 EASILY PORTABLE WITH INCLUDED STORAGE BAG - The Athletico Dugout Organizer folds up and packs away into the include carrying bag. Take it with you from game to game or travel with it to tournaments. The IRON AMERICAN Baseball/Softball Bat Rack is the steel, Heavy-Duty, rugged bat rack you've been looking for. Plain and Simple. Tired of just leaning your bats up against the fence during games and seeing them get kicked, knocked over, and damaged? We were too! At Iron American, we designed this 12 gauge steel, heavy-duty bat rack that would securely hold bats to protect them and keep your dugout or garage looking clean and organized. Permanent or Temporary Install Made Super Easy! Whether you're looking to put up permanent bat racks at your field or Stadium dug-outs or just looking to organize your garage at home, we've got you covered. We've included BOTH permanent mounting hardware & temporary hanging harware! The permanent mounting hardware includes 2 black oxide screws with concrete/drywall anchors and washers. For temporary hanging, we've also included 2 steel carabiners for EASY attachment or hanging from baseball fences, etc. (see pictures!) Some similar products have HOOKS for hanging which, according to many reviews, either break or continue to fall off!! Our carabiners guarantee a firm, level hold that won't detach during a game or practice! Our Bat Racks are 100% Made in the USA with 100% American Labor. These racks are made from 12 Gauge Solid Steel and finished with our signature, textured matte' black powder coat. As usual, we stand behind our products 100%. If there is ever any issue with your rack, contact us immediately and we'll help resolve the situation. Customer Service is our absolute #1 priority, and always will be. 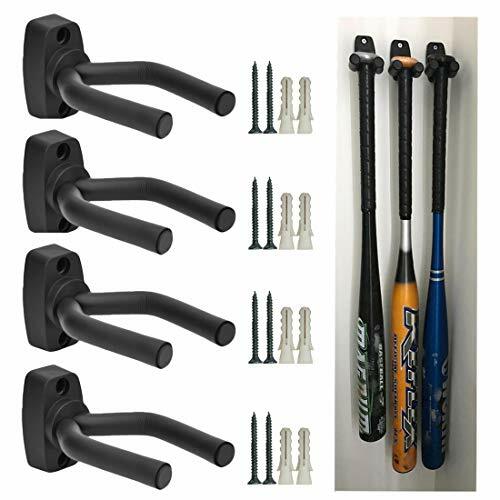 PORTABLE Fence Bat Rack / Bat Hooks - Holds (14) Wooden & Aluminum Baseball or (14) Softball Bats as well as Gloves, Balls, Bat Bags, Batpacks. Put up & take down with ease! SAFE & EASY INSTALL - Very easy to install and take down! 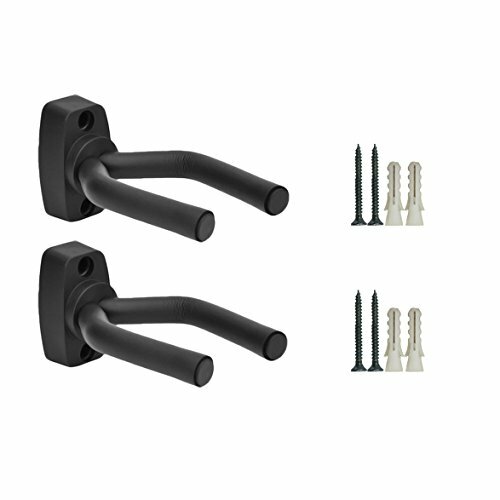 Comes with (PERMANENT & TEMPORARY Mounting Hardware) (2) 1.5 black screws, (2) black washers, (2) universal wall anchors / (2) Steel Carabiners for Fence hanging. Screw holes are EXACTLY 16 inches apart, making mounting into drywall with studs super easy and SAFE. DESIGNED WITH USE IN MIND - Designed with Longevity in mind by using 12 Gauge SOLID Steel to withstand rugged use. How exciting to get an autographed bat! 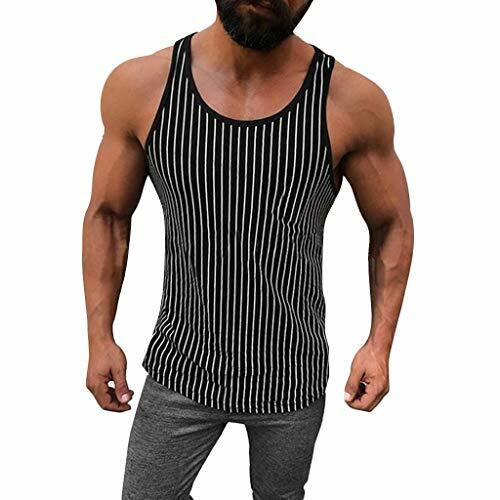 But feels bad as no idea how to show off! Hey! Look over here, this bat holder mount is absolutely a best solution to you! Easy to install and space saving, you can display your bat where is easy to catch eye, it will also be a fantastic decoration to your home. Note: Have to figure out the most proper place to install those set bracket. What if you receive a broken set, please contact us, replacement or refund is available to you! 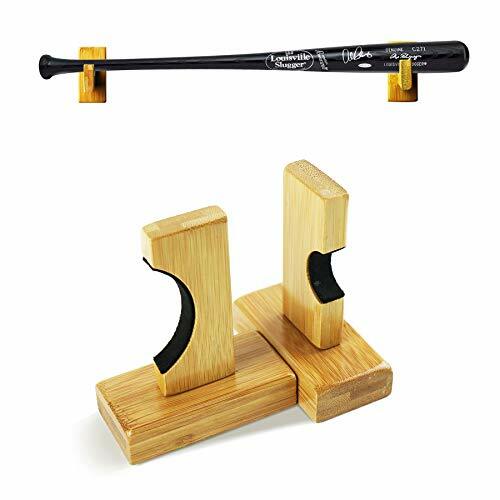 SET OF SOLID PINE WOOD WALL MOUNTS - Sturdy 2 piece bat holder wall mounts to display any baseball / softball bat horizontally. 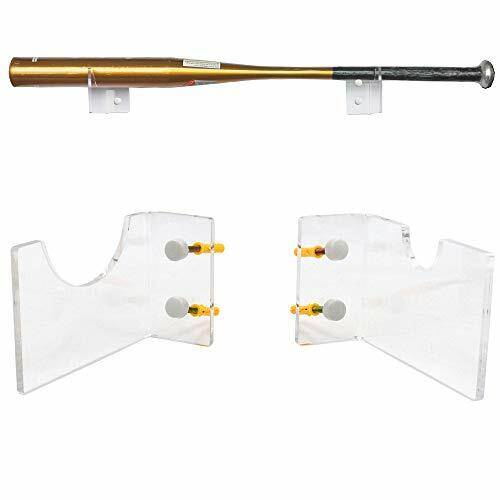 BEST AESTHETIC BAT WALL MOUNT - Bamboo material with polished bright dye keeps the mount away from getting rotten, hidden screws so no hardware is shown using a keyhole design, horizontal display showing full length of collectible baseball bat. FELT LINER DESIGN - Lined with felt where the bat is placed to keep in pristine condition, soft pad would protect your precious bat from scratching. BEST GIFT FOR SHOWING OFF - Wanna show off your personal bat, collectible bat or autographed bat? This bat display mount is a must have to display your collection! EASY TO INSTALL - (Hardware included) Drill the screws into the wall and left 1 cm/ 0.39 inches outside for hanging the bat rack. Only One wall rack - No bat included. Just 1 piece Two ways to measure your bat. 1. Measure the circumference of the bat top . If it is over than 135 MM (5-11/32 inch ), our rack will hold it. 2.Measure the diameter of the bat top . If it is over than 43 MM (1-11/32 inch), our rack will hold it. Universal - The inner Diameter is 43 MM (1-11/16 inch), which fits most baseball bat body. Easy Installation- Three Pre Drilled Holes for easy installation. Hardware included. No Scratches - The wall mount is covered with rubber. While resting on the wall mount, Your baseball bat will be protected. Baseball bat wall mount acrylic. 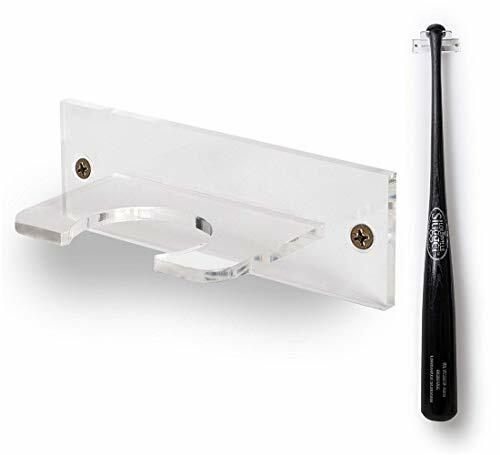 SET OF STURDY ACRYLIC WALL MOUNTS - 2 piece holder to proudly display any baseball or softball bat. CUSTOM CUTOUTS TO ACCOMMODATE BOTH ENDS OF THE BAT - Laser cut clear acrylic to give your bat the floating appearance. EASY TO INSTAL (HARDWARE INCLUDED) - 4 screws and anchors are included. Can be hung with a screwdriver or drill. 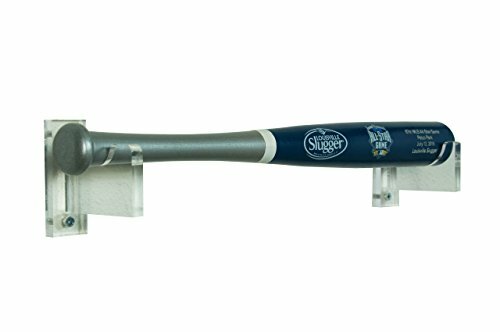 PERFECT GIFT FOR BASEBALL FANS & COLLECTORS - Show off your collection of game-used, autographed, or collectible baseball bats. 100% MONEY BACK GUARANTEE - We are sure you will never have any issues with your new purchase but in the rare case you do, just let us know and we will make it right! We strive for 100% satisfaction with all our customers and products. VERTICAL BASEBALL BAT DISPLAY - Proudly hang your baseball or softball bat. Opening will fit any size bat. STURDY ACRYLIC HANGER - Hung with 2 screws and anchors to ensure the safety of your bat. 100% MONEY BACK GUARANTEE - All displays are backed by 100% guarantee. If you're not satisfied we will replace it or refund you. Quantity : 2 Racks - hold one baseball bat - No bat included. Clear Acrylic - 5MM thick acrylic, support your baseball bat securely. Horizontal display - No vertically. Hardware and screw caps included - Your screws will be hidden in the caps securely. Before installing , Please peel off the white film of the acrylic , which protects the acrylic from scratches. Then you will see very clear acrylic. The Picvur Baseball/Softball Bat Rack is the Alloy, Heavy-Duty, rugged bat rack you've been looking for. EASY TO INSTALL (HARDWARE INCLUDED) -complimentary screws and plastic dry-wall mount are included. STURDY HANGER - Soft rubber coating and sponge material ensures no mark, scratch or imprints on your loved bat. Hung with screws and to ensure the safety of your bat. If you're not satisfied we will replace it or refund you. 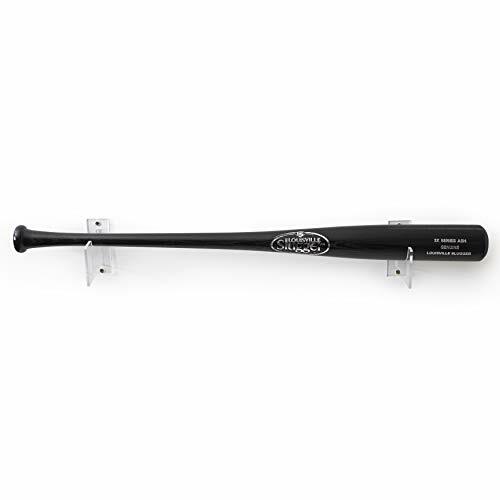 BASEBALL BAT DISPLAY FOR 5 BATS - Proudly hang your baseball or softball bats. Opening will fit any size bat. EASY TO INSTALL (HARDWARE INCLUDED) - 3 sets of screws and anchors are included. 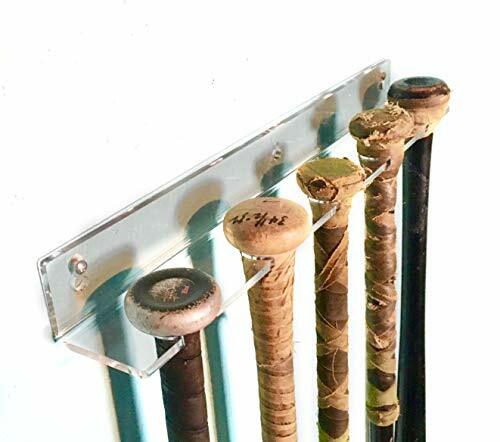 The bat rack has 3 pre-drilled keyholes to make hanging the mount easy and painless. STURDY ACRYLIC HANGER - Hung with 3 screws and anchors to ensure the safety of your bats. 100% MONEY BACK GUARANTEE - All displays are backed by 100% money back guarantee. If you're not satisfied we will replace it or give you a full refund. The Rawlings fence bat rack is an exceptional Rawlings product. The BR bat rack can help both beginner to professional athletes Excell on the field. 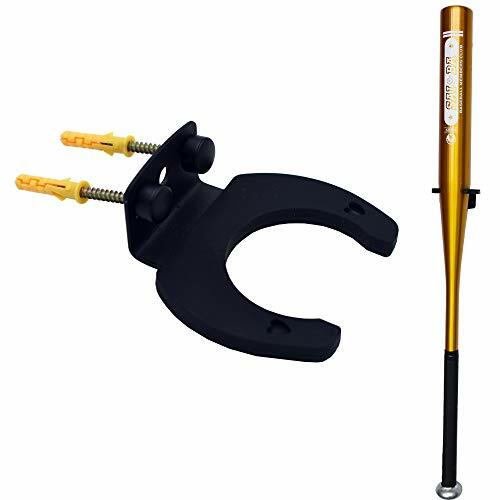 Rotatable arm design can clamp your baseball bats more tightly and avoid loosening keeping it safe and sound. 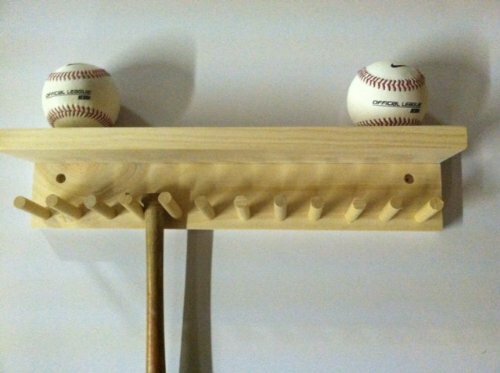 Vertical display your baseball bats, help to save so much extra space in your room. Personalized protective padding gently and securely supports the bats, unlike non padded wooden hangers that can leave scratches on your bats. SUPER EASY TO INSTALL, strews and screw adapters coming together, directly screwed into walls to hang anywhere.